If you prefer reading the detailed guides with screenshots, please scroll down. The information in the written guides also contains some details that are not present in the videos. The videos are meant as quick-start guides – the Metatrader 5 tick data export video is about 1:30 minutes long while the tick data import and usage video is about 2 minutes. Note that you can also enable captions if you want some details about each step. 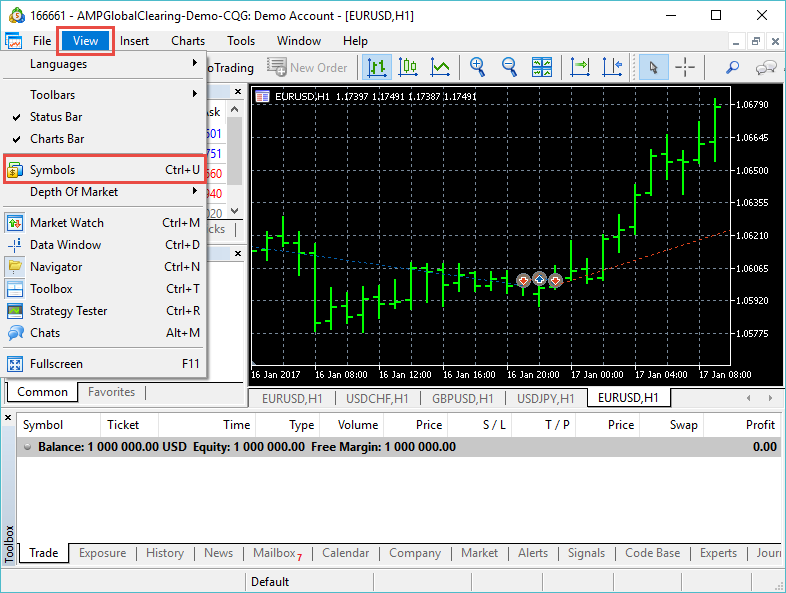 Run Metatrader 5, connect to the account that you would like to use for exporting data then go to View -> Symbols or press CTRL+U. In the dialog that opens, browse the categories to locate the symbol that you would like to export then select it in the table on the right (it should turn blue). After selecting the symbol, open the Ticks tab. 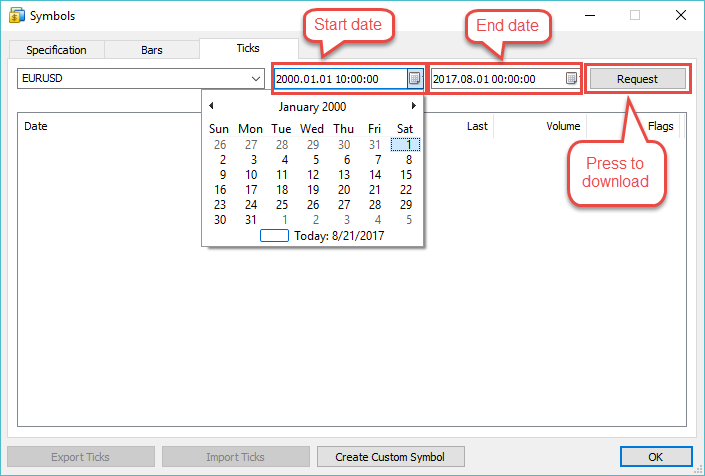 Configure the desired starting date (left date input), the ending date (right date input) then click the Request button to download the tick data from the broker. The download will start from the present and work its way back in time. The broker may not necessarily have all the data you want, most MT5 brokers only started recording data around 2015-2016. 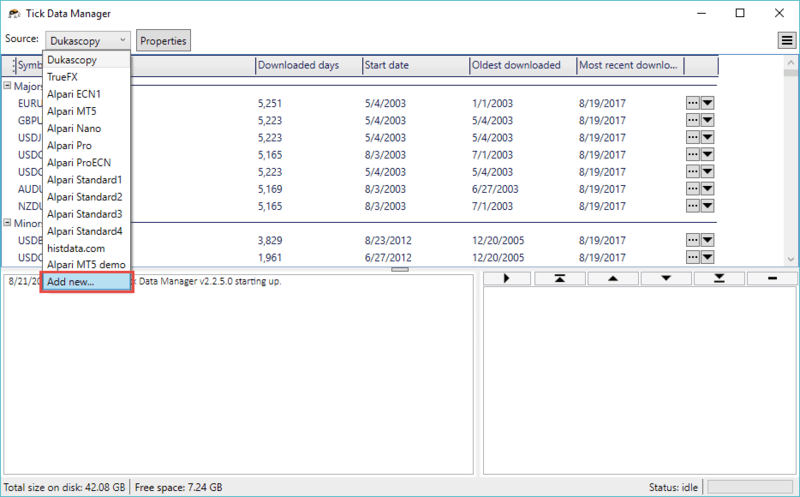 It’s worth mentioning that depending on the selected date range and data availability, downloading and processing the data may take a rather long time. When the download is finished, click the Export Ticks button, select the path to save to and the file name, click the Save button then wait patiently until the export is done. In case you run into any difficulties with the tick data export process or if you have any questions, please head to the MQL5 forum and post there for assistance. In order to import tick data, first of all a new custom tick data source needs to be added. 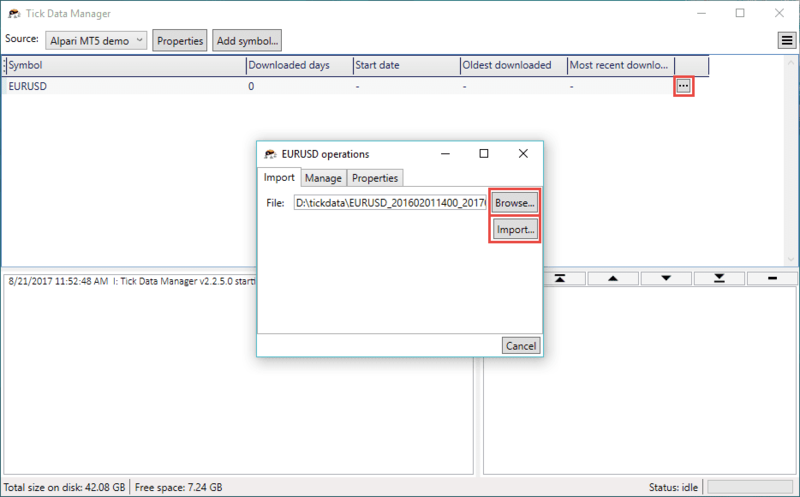 Start by running the Tick Data Manager and select Add new… in the Source dropdown. In the Add new tick data source dialog that comes up, fill in the Name of the new tick data source (e.g. the name of the MT5 server if you’re importing MT5 data) then fill in the Description if you wish. The description is optional and only serves to better identify the source or to store notes related to it. The Path will be filled in for you automatically while you type the symbol name, you don’t need to modify it (and cannot modify it). After clicking OK, the new tick data source will be added and selected in the dropdown. Click the Add symbol… button to add a new custom tick data symbol to your new source. 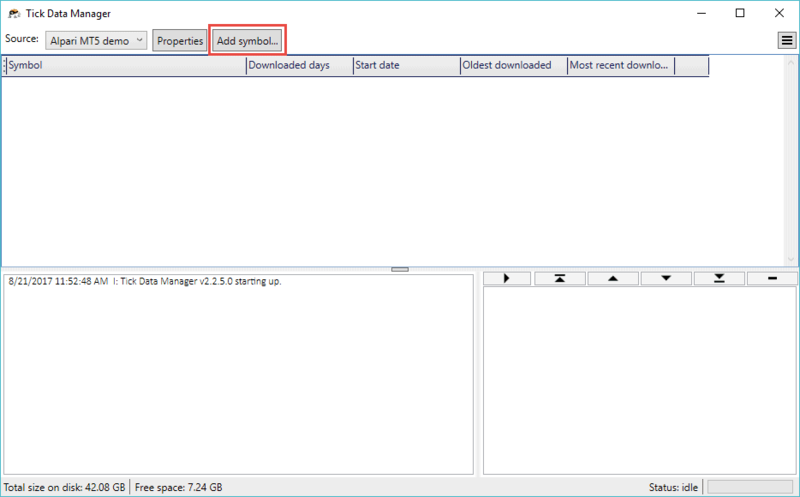 In the Add symbol dialog, the easiest way to configure the details is by clicking the Autodetect from CSV… button, browsing to the CSV file and finally clicking Open. 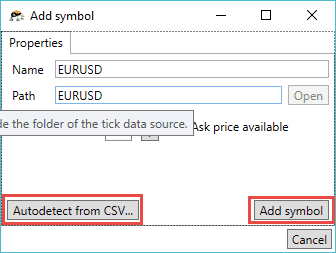 The Tick Data Suite will open the CSV file, identify the symbol configuration and fill it in for you. Note that this step does not import any data, it merely “glances” at the file to identify the details. 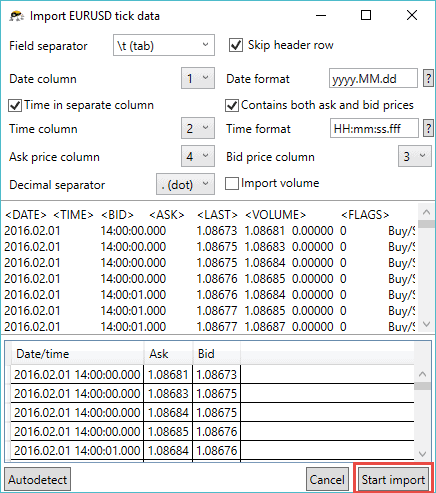 Alternatively, you can manually fill in the data – type the Name, select the number of Digits (fractional decimals) and enable the Ask price available checkbox if the source data has ask as well as bid prices. As before, the Path field is automatically filled as you type the symbol name and cannot be edited. The newly added symbol will show up in the list of symbols. Click the … button to its right to open the Symbol operations dialog. 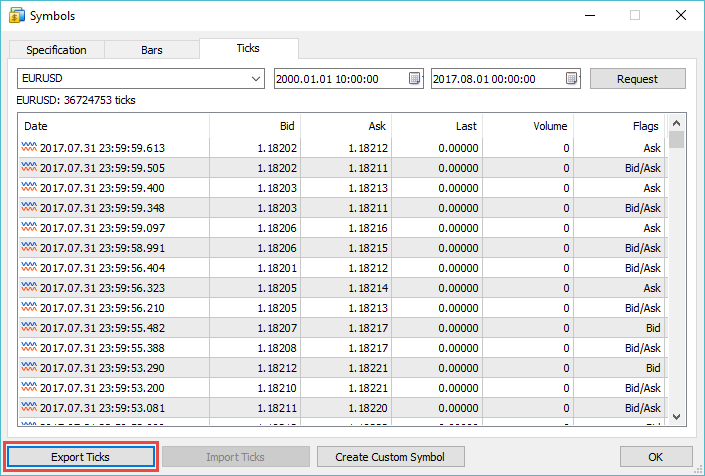 In the Import tab, click the Browse… button, locate the CSV file then click the Import… button to open the Import tick data dialog. The bottom part of the dialog is divided in two areas: the upper one shows a raw file excerpt while the lower one dynamically updates the parsed excerpt as the configuration is modified. If the bottom area does not show anything, the import configuration is not correct and you won’t be able to start the import process. In case you wish to re-run the automatic detection process all you need to do is click the Autodetect button in the lower left corner. 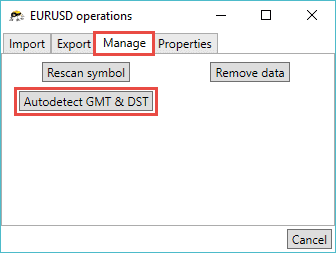 To start the GMT/DST autodetection process, click the … button next to the imported symbol to open the Symbol operations dialog, select the Manage tab and click the Autodetect GMT & DST button. 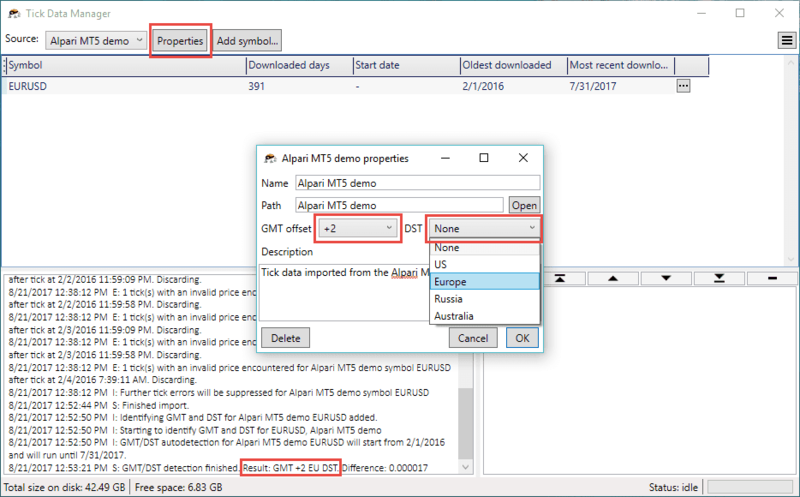 This will queue a GMT/DST automatic detection task that will go through the symbol data at key dates and compare it against the reference Dukascopy data in order to identify the best match and obtain the GMT offset and DST configuration of your custom tick data source. 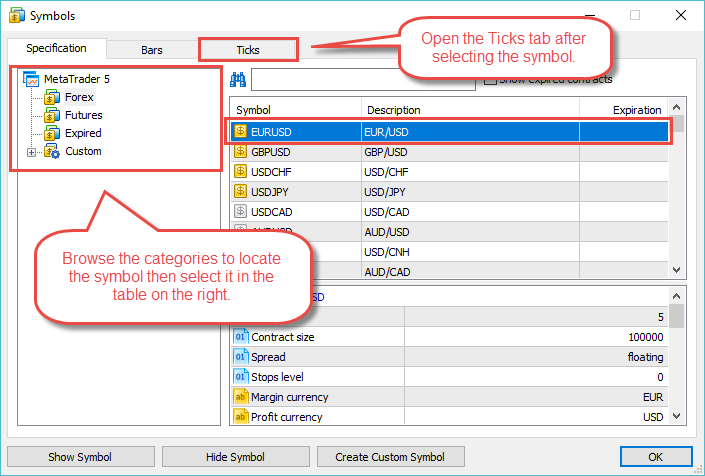 In order to use the newly imported data in MT4, start by selecting the MT4 symbol in the backtest pane; after that all you need to do is open the Tick data settings dialog and select the new tick data source in the Source dropdown. 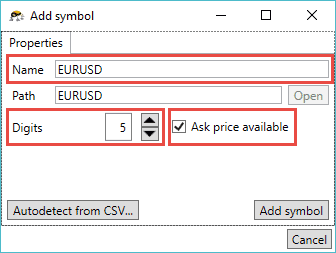 If the symbol you imported is a Forex symbol that does not have an out of the ordinary name, chances are it will be automatically selected for you. If it’s a CFD or the Symbol dropdown remains blank, manually select the symbol from the dropdown. 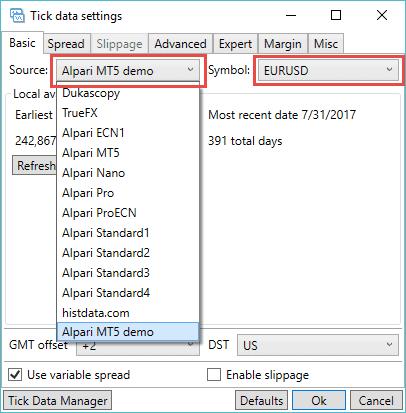 Any way to do the reverse: Use mt4 tick data (aka tick data from 3rd party sources gathered by TDS) and export this tick data into MT5 (five)? So that we can backtest natively with mt5 and use whatever tick data we want. 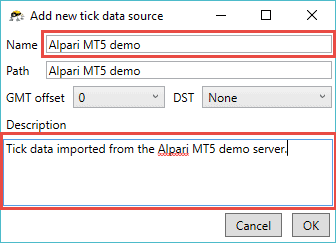 Tick data can be exported from TDS in a CSV format that can be imported by MT5. Why in the world would you go to all this trouble? Test in MT5. It’s got everything you want and then some. Then convert to MT4 if you must. Most people are still using MT4; at this point MT5 is still largely unpopular by comparison. Take this scenario for instance: you purchase an MT4 EA that you want to test using tick data from your broker that has an MT5 server. Obviously, you cannot test the EA in MT5 so the best course of action is the one described in this article. Also, I would argue that MT4 with the Tick Data Suite has more features when it comes to tick data backtesting than MT5. The only true advantages of MT5 are multicurrency backtesting and the possibility to use multiple cores during optimizations.